‘Small fishery, big fish’ – that sums up the character of Avington fishery, near Winchester. In the anglers’ room there’s a trout mounted in a large, bow-fronted glass case. The monster rainbow was reared by fishery manager Roy Ward. Sadly, it died before being stocked and was not caught. It weighed a massive 12.25kg (27lb). 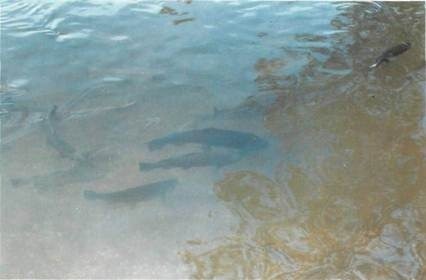 Four rainbows of around 4lbs (1.8kg). These are about average for the fishery but Peter has taken a four fish bag totalling a staggering 72lbs 8oz (32.88kg) from Avington. Peter’s multi-pocketed jacket is ideal for carrying small items such as priest, scales and forceps. With his net on his back he’s free to stroll around looking for fish. Avington fishery is about 5 miles north east of Winchester, at Itchen Abbas. By car: leave the M3 at junction 9 and go north towards Newbury. 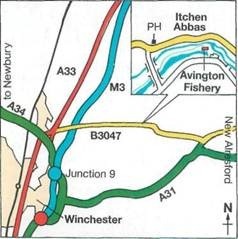 Turn right at junction with A33 and right again on to the B3047 to Itchen Abbas. In the village, turn right on to the unmarked road opposite The Plough public house (PH). After crossing the second bridge turn left. Avington fisheries is on the left just past Park Farm. 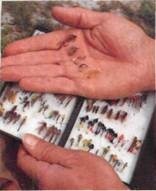 A selection of successful nymph patterns from Peter’s ‘Avington box’. (From top to bottom) Damsel Nymph, Gold Ribbed Hare’s Ear, Peter CockwiH’s Lead Bug, Corixa and Freshwater Shrimp. Most nymphs are fished 2.5-60cm (1-24in) down. 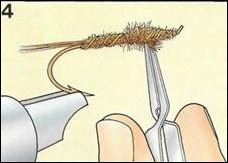 A simple and reliable way of attaching your fly line to the backing is to Superglue it together. To do this, scrape off the outer coating of your fly line to reveal 3-4cm of the core and glue this into the braided backing. 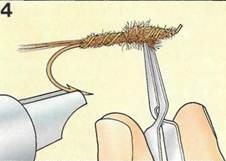 Smear some glue over the joint and whip over it. 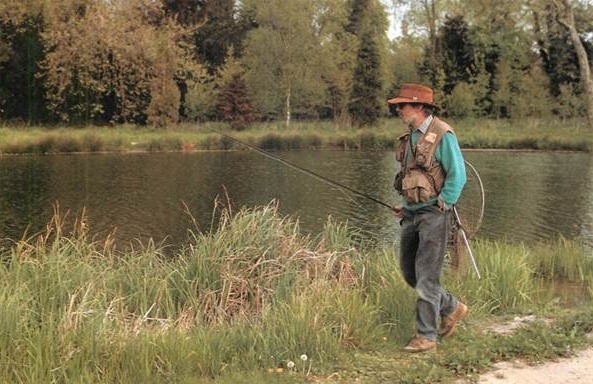 When retrieving, Peter keeps his rod pointing down and towards the fly rather than to one side. This directness means that he occasionally bumps a fish off or snaps off, but this is very rare. The great advantage is the extra sensitivity – Peter is able to feel a fish as soon as it touches the fly. A fish is played out on a snag-free middle pool. At this time of the year Avington’s weed-free, gravel-bottomed waters present few problems for the angler. In summer however, the clear alkaline waters encourage milfoil and Canadian pondweed to grow to the surface and getting the fish out can be difficult. 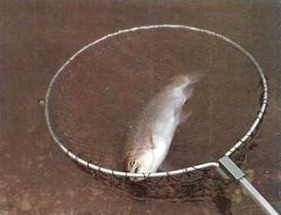 A fish is ready for netting when it’s over on its side with its head out of the water (like the one shown here). It is early May. Peter is at the stock ponds chatting to his old pal, Roy Ward. There is stiff competition between fisheries to get anglers on to their waters. Roy does this by stocking with prime fish to provide value-for-money sport. Rainbow trout are the obvious choice because even though they are not native to Britain and are artificially reared they have a faster growth rate and require less rearing space than brown trout. What is more, unlike brownies, they do not have the habit of disappearing after being stocked. Avington is essentially a stalking water, which means that Peter is going to be constantly on the move. So he keeps his tackle to a minimum. 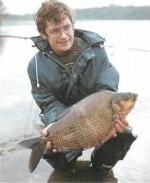 Rod Peter recommends a rod of between 9-9 1/2 ft (2.7-2.9m). 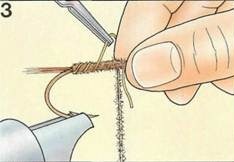 Fly rods are graded in their ability to handle lines ranging from 1-15 (1 being the lightest and thinnest). 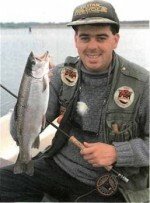 A rod rated at 6 or 7 AFTMA (Association of Fishing Tackle Manufacturers of America) is about right for Avington. 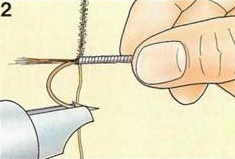 Lined rings prolong the life of a rod. Reel The reel serves only to store line. Get one with a good drag system. Line Peter’s line is a 7 weight forward, intermediate density with a braided core and PVC coating. 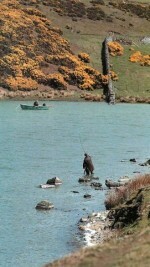 A subdued colour such as green is probably best for this kind of fishing. The leader is 3m (10yds) long and 5lbs (2.3kg) b.s. at the point. It is attached to the fly line by a needle knot. Flies Peter opens his ‘Avington fly box’ to reveal a selection of leaded nymphs. They are not as attractive as the sort of flies you’d see in a whisky advertisement but the fish seem to like them. Nymphs are meant to resemble aquatic insect larvae. Many have a distinct thorax, abdomen and tail and they are fished on the retrieve to create the impression of a mature larva coming up to the surface. For Peter, imitation plays only a small part though, and his choice of patterns is based very much on practical considerations. Firstly, a leaded, sparsely dressed fly sinks quickly so that it gets down to the bigger fish which are often reluctant to move up in the water. Secondly, the fly has some light coloured parts on it so that Peter can watch it closely on the retrieve. There is a ruling at Avington against flies over 2.5cm (lin) so Peter’s Avington flies are tied on size 8,10, or 12 standard shank hooks. He uses a tucked half blood knot to tie a Damsel Nymph on to his leader. 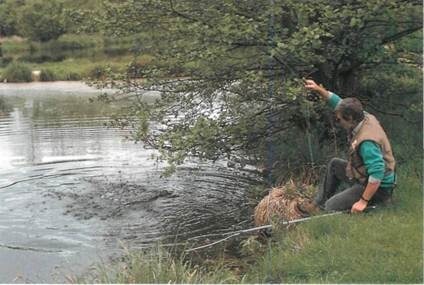 Net Peter’s landing net is a large round salmon net – big enough to accommodate a record trout. A quick-release leather strap enables him to take the net off his back and extend the handle while controlling the fish with his other hand. Other essentials It’s almost a Peter Cockwill trademark: every item of tackle carried out of necessity – simple, functional and reliable – and yet here he is sporting a multi-pocketed jacket, wide-brimmed hat and polarising glasses (on a dull day). What’s going on? Is he the Godalming Cowboy? Peter’s jacket is ‘tailor-made’ for stalking – drab so he doesn’t stand out like a sore thumb and scare the fish – with zipped pockets and Velcro fastening pouches for his priest, scales and bits and pieces. It’s waterproof too, and judging by the overcast sky that may be a good thing. His hat and glasses are an essential combination on Avington. 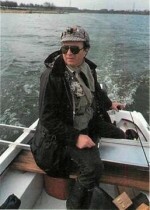 They help him to spot the fish that the other anglers don’t see. 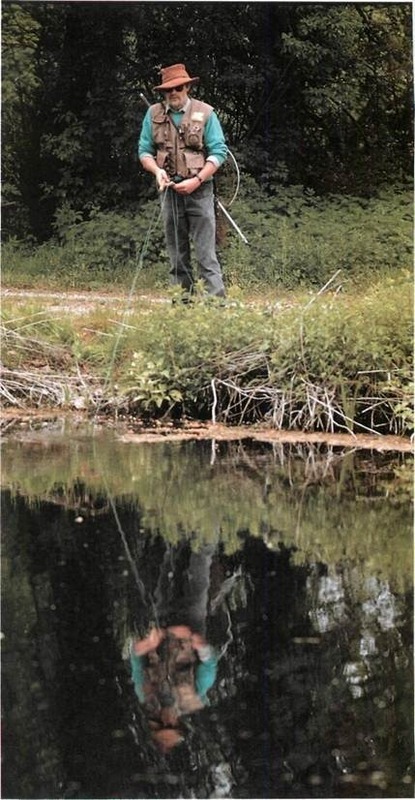 What is more, glasses protect the eyes from the fly when casting. So for safety’s sake it is always wise to wear a pair. The usually crystal clear, Itchen-fed waters are faintly tinged and a slight breeze makes it difficult to spot the fish. Peter stalks the margins of the bottom lake looking for tell-tale signs. He stresses the importance offish-finding rather than waiting for a chance encounter. There is a knack to this. To the untrained eye the water’s surface is inscrutable – nothing more than patches of reflected colour – but if you know what to look for it’s possible to see below the surface. What to look for Sometimes you can ‘pick up’ the trout as dark torpedo-shapes cruising through. This is much easier if you are looking into the uniformly dark reflection of a tree. Weed or a light patch of clay on the bottom serve as a background against which to spot fish. Watch out too for white flashes as a trout opens its mouth. A fish that does this is often snapping at insects and willing to feed. Sometimes a fish betrays itself with a flick of a fin. Peter spots a fish close to the bank. He casts his Damsel Nymph to it and slowly begins to retrieve it. 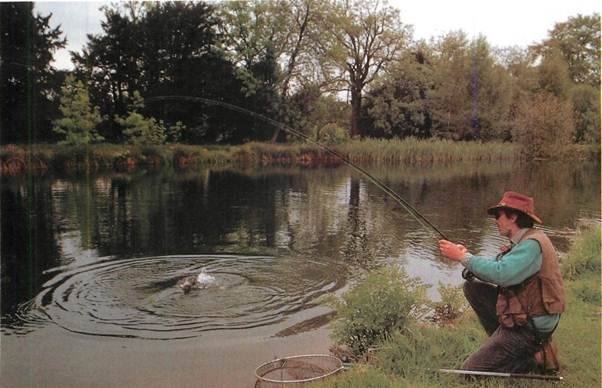 ‘There are certain things you can do to increase your chances of getting a large fish: fish known ‘holding’ areas, fish deep water, fish quietly and retrieve slowly.’ Peter retrieves slowly, the fish follows the fly and Peter watches the fish. It turns away and melts into the depths. 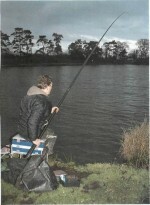 Peter casts effortlessly and with pin-point accuracy to where he thinks the fish might be. 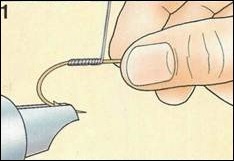 ‘A beginner needs to learn the mechanics of fly casting- he can’t do anything else until he’s done this,’ says Peter, who is himself an NAC (National Anglers Council) instructor. He reckons on being able to teach a beginner the basics of casting in about half an hour – time well spent. Half way through the retrieve Peter’s rod springs to life. It looks -like a good fish, boring deep and putting a healthy bend in the rod. It makes a few dangerous surges under a patch of surface scum, swims towards Peter and straight into his net. 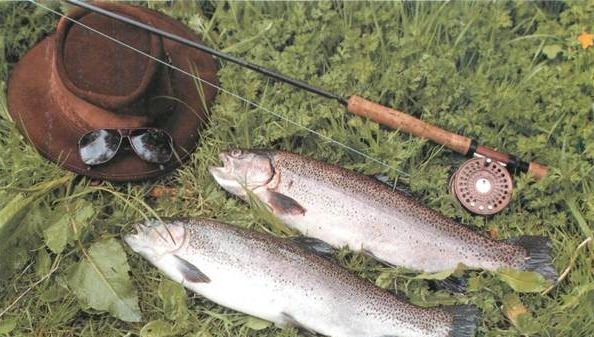 The handsome rainbow weighs 4 1/2 lb (2kg) – big for some waters, average for Avington. Peter walks further up the left hand bank where the water is heavily shrouded with willows. Avington’s deep (about 3m/10ft here) and under the trees the water is ink black. About a third of the way across two dark jrey shapes move through. Peter casts tnd slowly retrieves, using one hand to itrip 7-10cm (3-4in) of line at a time hrough the rings. The fly creeps into the >lack water under the trees and some-hing orange turns in behind it. On closer nspection it turns out to be a sizeable Goldfish. Peter stops retrieving, the fly links and the goldfish turns away. Peter )egins to retrieve again, the goldfish turns •ound and follows the fly. This ‘cat and nouse’ game continues until Peter lifts he fly clear. Smaller, unwanted trout can be discoursed from taking a fly in this way. The Appetizer is supposed to imitate a roach fry – which it does very well – but it catches on waters where there are no roach. The Mayfly works well at Avington though Avington has no mayflies. Furthermore, some patterns like the Butcher – a black and pinky red standard wet- and the Viva – a successful black and lime-green lure-don’t resemble anything. 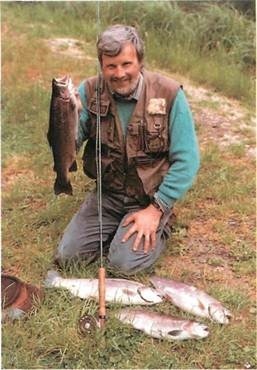 Peter thinks that trout often respond more to ‘trigger points’, snapping at a fly either because it behaves like an insect with which they are familiar, or out of curiosity or sheer aggression. Peter is trying the slightly faster, one- handed figure-of-eight retrieve. Each time his White Nymph approaches the bank, Peter shivers the tip of his rod slightly. This gives an attractive wiggle to the fly and may entice a take. There is a sense of anticipation as Peter moves on to fish the top pool. This was the scene of his legendary battle with the record rainbow which he took on a Gold Ribbed Hare’s Ear. At the near end of the lake there’s a 6m (20ft) hole. Peter starts by fishing over this with his Lead Bug and he’s into another fish almost immediately. It makes a gallant effort to bury itself among the roots of an alder, but Peter’s soon got it on the bank – another beautifully conditioned, full finned rainbow of around 4lb (1.8kg). By midday, Peter has completed his four fish limit with another four pounder taken half way up the top lake. He hasn’t had any record-breakers today but has had a thoroughly enjoyable morning’s fishing. Peter might be quite right in thinking that the future of trout fishing lies in small-water-big-fish fisheries like Avington.